It’s at this time of year that things start to heat up for The People’s Truck and Convoy. The 2016 People’s Truck launch was a few weeks ago at the Kiama Leagues Club. This year’s launch was our biggest yet with over 200 people coming along to show their support. It was a great night, for a number of reasons. Firstly, it is a truly great feeling when I see the amount of support that surrounds The People’s Truck, to see such a generous group of people come together and put in their own money to support such a great cause. This year’s launch raised an impressive $34,000 to kick off the 2016 People’s Truck. The second reason this year’s launch was so special is because we got to hear from a truly brave young man, Matt White. Matt’s dad Dave is one of our driver’s at McMahons he’s a great guy and respected amongst our team. Matt is very much like his dad, he likes to play soccer and he’s good at it, playing at a national level. Matt was diagnosed with cancer as a teenager, he went from being really fit to being constantly tired and not feeling well. He knew something wasn’t right. One night while he was at a friend’s house he got a phone call from his parents telling him to come home, when he got there they already had a bag packed and were ready to take him to the hospital. Matt underwent some very serious treatment and some very heavy surgeries. Facing what most of us never have to deal with in our lives, let alone at such a young age. Matt fought really hard, and he won his battle. He is now in remission thankfully. It is hard to hear this story, to have a young man’s youth taken from him so brutally. Matt stood in front of 200 people at our launch and shared this story and how it impacted his life, instead of being bitter about his journey Matt went to Uni and studied nursing, to give back to those in need. The positive thing to hearing about Matt’s journey is that he survived, he was surrounded by volunteers that helped him with his school work and listened to him when he needed to talk. Illawarra Convoy and The People’s Truck is all about helping out these kids, to provide them and their families with the support that they need in what is probably their darkest hour. 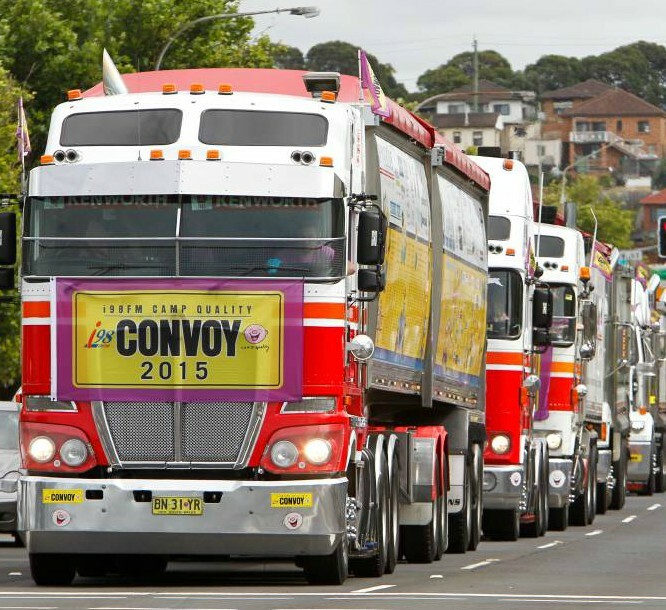 I’m looking forward to this year’s convoy, and hoping it is our biggest yet. Thank you again for your support, we couldn’t do it without you.